Independence. Americans strongly believe in the concept of individualism. They consider themselves to be separate individuals who are in control of their own lives, rather than members of a close-knit, interdependent family, religious group, tribe, nation, or other group. Equality. The American Declaration of Independence states that “all [people] are created equal,” and this belief is deeply embedded in their cultural values. Americans believe that all people are of equal standing, and are therefore uncomfortable with overt displays of respect such as being bowed to. Informality. This belief in equality causes Americans to be rather informal in their behavior towards other people. Don’t be surprised if store clerks and waiters introduce themselves by their first names. Many people visiting the US are surprised by the informality of American speech, dress, and posture. Don’t mistake this for rudeness or irreverence; it’s just a part of their culture! Directness. Americans tend to value, frankness and openness in their dealings with other people. They believe that conflicts and disagreements are best solved by means of forthright discussion among the people involved. Americans believe that if someone has a problem with someone else, they should tell the person clearly and directly in order to come up with a solution to the problem. Commemorate the birthday of the African-American civil rights leader Martin Luther King, Jr., who won the Nobel Peace Prize in 1964. Celebrate love and romance by exchanging tokens of love (usually cards, candy or gifts). Honor past American presidents like George Washington (the nation's first leader) and Abraham Lincoln (Civil War hero who helped abolish slavery). Celebrate the patron saint of Ireland with parades and parties decorated in Irish green. Play a clever (but harmless) trick or tell a joke to someone with a good sense of humor. Remember the men and women who died while serving in the U.S. Armed Forces. View public displays of fireworks as Americans mark the date when thirteen U.S. states declared their independence from England in 1776. Honor the contributions and efforts of hard workers throughout the country. Pay tribute to Christopher Columbus, who is traditionally thought of as the discoverer of the Americas in 1492. Feast on a traditional meal that commemorates the dinner shared by the Pilgrims (first settlers of the thirteen colonies) and the Native Americans. Celebrate the birth of Christ, leader of the Christian faith, by exchanging gifts with family and friends. Of course, the US is a large country, made up of many different cultures. 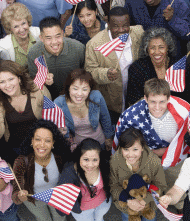 Your cultural experience is bound to differ depending on where in the US you choose to study. To learn more about individual states, visit our State Guide.